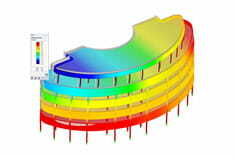 Unfortunately, I find no information about how I can measure in RFEM a strip foundation. Is there no way for that? What would be a sensible alternative? 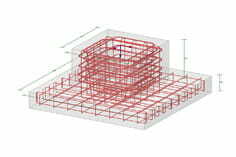 Currently there is no additional module for RFEM in which strip foundations can be dimensioned. The add-on module RF-FUND Pro treats only single foundations, which can be arranged at node bearings. It is usually the case that "linear bearings" are used in a model, for which then strip foundations are to be measured. One could create a substitute model for this purpose by applying the relevant bearing forces resulting from a "1m strip" as a load on a short rod (e.g. B. Rigid rod, since no additional own weight) applies. As a result, bearing forces are obtained at a nodal bearing for this 1 m strip of the wall (see Figure 1). For these nodal bearing forces, one could then measure individual foundations in accordance with EN 1997-1 in RF-FUND Pro. Here you could train the "strip foundation" as a 1m wide plate foundation. It could also replace the line camp by a reinforced concrete slab with elastic bedding. Then one could dimension the plate, which depicts the strip foundation, in RF-BETON surfaces. The evidence of the position security or the bottom compressive stresses, etc. but you would have to then manually from the RFEM results (z. B. Evaluation of the contact stresses σz). See also the technical contribution on our homepage over the following link .